Earn $5.15 in VIP credit (515 points)What's This? 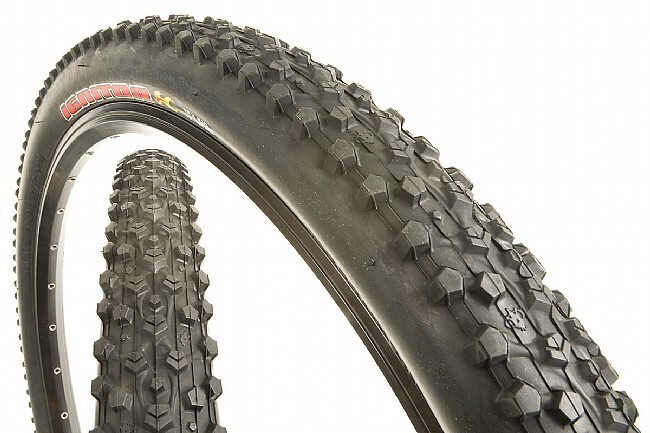 The Ignitor is a fast xc race tire with more bite than a center slick. It has well spaced medium profile center knobs to roll quick on the straights. This matched with a long wearing and low rolling resistance 70a durometer rubber compound assures speed. The higher pentagonal side knobs corner aggressively. Folding Kevlar bead. All black. 60 tpi. 35-65 psi. Size 29x2.1" (52-622 ISO). 622 grams. Fit on my WTB Dual Duty is good for running tubeless conversion &40although unauthorized by manufacturer&41. The heavier carcas for is a good compromise for a tubeless conversion. This isn't Maxxis' highest thread count tire. But, it provides a great compromise between traction and drag. I ride the rocky trails of north eastern and south central PA. I put this tire on the real wheel of my Specialized Carve and have had it out about ten times. I'm a sucker for technical trails and fast down hills and this tire does it all. Tight on the turns of fast downhills with great speed and great grip over all terrain including rocks, mud, and hard packed dirt. This tire even helped me crack a few new uphills i had previously failed multiple times. If you ain't crashin' you ain't ridin'! Great tire, fast, grippy - used in mostly hard pack to loose sand. I really like this tire. It's light weight and handles very smooth in turns. I ride mostly in the city so the nodes wear down a bit over time. I had them for a year and I've ridden in the summer and winter. It's a great all-season tire to me, but I did get a few flats because of it's thin walls. Still I think it's worth it's weight! Seriously, this tire is like riding on rails. Rolls fast and smooth but cannot recommend. Two reasons, one most flats I have ever had, weak side walls even when pumped up high. Second is the tire is tricky to keep round, keep getting budges or bubbles. If you want a tire that goes fast, until you get a flat, this is for you. I ride mostly in a sharp rocky terrain which may influence my opinion. I used this as a front tire on my Niner Air 9 for two seasons. This tire made it through two 24 Hours of Moab races, running it tubeless with Stan's and never had a flat. That course is extremely rocky, (sharp rocks) and I never had any issues. Tires are personal. I am tubeless on my 29er and have tried a number of different tires (Geax Saguaro, Specialized Captain, Bontrager Team Issue, WTB, Michelin, and so on). Everything I tried didn't seem to fit my riding style as I consider myself an aggressive down-hiller and technical climber. All of the above mentioned would either wash out on a fast downhill corner or leave me spinning on a loose, rocky, or technical assent. My local bike shop offered me for free, a pair of Ignitors they had taken off another 29er. What MTBer can refuse free tires? I'm glad I didn't as the Ignitors have exceeded any and all expectations. They are relatively light, have a strong sidewall that defend against pinch flats, and grip grip grip in the corners and on the climbs. This is my soul-mate tire and I will be hard pressed to try anything else. These tires came on the 2011 Kona Mahuna I purchased last week and I was excited to get this bike on the hike bike trail behind my neighborhood. My wife followed me on a 2010 Redline Proline Pro24 with Tioga PowerBlock tires and we rode for 2 hours through the trails. The next morning the Maxxis tires were flat, but not the Tiogas. I took it to a shop and they said the tires and tubes looked like pin cushions. I was a little confused as I've been riding these trails for years now and hadn't had a flat. The bike shop guy explained to me that these tires were for racing and were too thin to ride on rustic trails. He said he'd order me some better tubes, but currently there were no tires that would sustain a trail like I'd been riding. I was a bit disappointed as I bought this bike to ride on that trail. Two days later I took the bike on a trail that is common to bike riders in Austin for a 2 hour ride and this morning the tires were still with air. That's a good sign, but I'm not a racer I'm just a guy who likes to ride whatever trail is closest. Anyone know of better stronger thicker tires?